Today was a very busy day. I started to paint a canvas and decided I had better stop and finish up a few other goodies before proceeding with something new. This time of year is very busy, ideas running through your head for show sellers, tags to be made, adding embellishments, it never stops. Now this first picture you may ask what is this all about? Well Lesley got hungry and wanted some lunch, for medical reasons I have to eat, I cannot skip meals. So I decided I wanted a grilled cheese sandwhich, I put my little pan on the stove, put the sandwhich in and turned my back for just a couple of minutes because I had to fuss with something. Well never leave your stove unattended right? or this is what happens. Good thing the smoke alarm didn't go off. My sandwhich just about burnt, the other side is good but this is what happens when you turn your back for a minute....I didn't do it, the Squirrels did. Anyone that really knows me knows I have a nick name and sometimes I think it suits me well. Today was one of them. Not only did I have a partially burnt sandwhich but I had the kitchen, which isn't very big, in total chaos. Stuff everywhere, the table with my paints and canvas I was working on, which will be featured tomorrow, the kitchen counter with stuff on it,. Anyways to make a rather long story short here are some things I am finally finished. The breadpan was given to me by my Mumsy, I painted gingers on them, then I cut out and painted the larger ginger, sitting amongst the spanish moss, I painted the spoons and not sure you can see it but I made a tag that hangs off the homespun on the spoon that says " fresh baked" and I put some little pics and a grubbied tea lite in. Love those battery operated tea lites. I enjoy grubbying them as well. 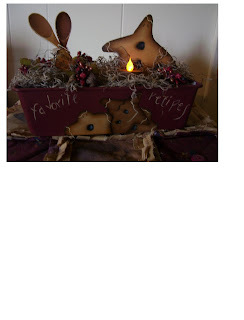 .And Last but not least, these were a lot of fun are my Post it Note holders. I got the idea from a Monika Brint book and I decided to make a few other designs. 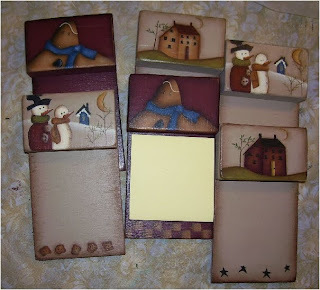 Monika's cute snowmen, Katrina Roncin gingers, and a Terrye French saltbox house. Add a little Post it note and keep it by the phone, computer room, kitchen or where ever. Thank you for stopping by and don't forget if you click on the picture you can see it in a bit more detail. Stay tuned, tomorrow I will show you my snowman canvas. Absolutely love the finished pieces. The post its are darling. Do you sleep? Giggle. LOL You must be up all night paint flying. Lovely painting as always Les!! LOL @ Jen's comment - squirrel poo?!! Everything looks fantastic Les. I love them all. I was wondering what the brown stuff was too. Did the squirrel leave you a little present? LOL Burnt grilled cheese goes right along with burnt boiled eggs I made one time LOL. I forgot they were on the stove and the water disappeared and the eggs got burnt and stuck to the bottom of the pot. LOL you guys are silly, no that is NOT Squirrel Poo. It is HP sauce. I love that stuff to dip my grilled cheese in. 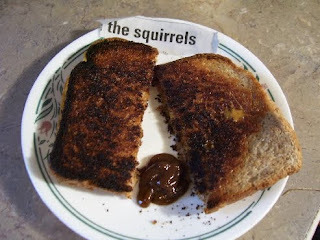 I served my DH a grilled cheese the other day...that looked allot worse than yours....same thing happened...I turned my back for a few seconds! Love the note pad holders...too cute!